I have a pretty intense grain allergy and a mild coconut allergy. If I eat white bread, my eyes get inflamed and I get asthma; the effects of eating whole grains are much worse--rice in particular. It is not a stomach intolerance, but a respiratory allergy, which is strange, for I don't have hay fever, although my sister, my mother and my nephew all do. 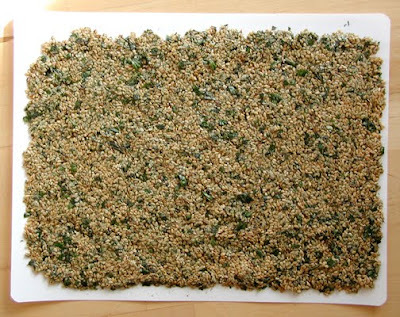 One of the best things to come out of the raw foods movement is the marketing of non-grain crackers made of seeds and nuts. However, they are very pricey. All the sweet cookie type raw things are filled with coconut, so that makes me keen on doing my own thing. Brigitte is big on flax and flax crackers. I'm not so keen on flax, but flax does make good crackers, so I'll start with the flaxseed cracker recipe. Flaxseed, or linseed, is (yes, you guessed it) the stuff that the artists' oil is made of. It is a cheap oil when it is made for industrial uses. The flaxseed oil for edible purposes, is extremely expensive and very volatile, so it is found in health food refrigerators in brown plastic containers and hard to eat before it goes bad. It is very high in omega 3 fatty acids, as high as cod liver oil. People eat flax seeds for the same purpose, but they are very mucilaginous (slimy) and used for constipation. I'm not keen on slimy food. I found out that chia seed is higher in omega 3s and easier to eat. It forms a gel when wet and is very like tapioca, but it is not as slimy. However, sliminess holds the crackers together. You can see here that I've added a little water to some flax seed (golden kind is best.) 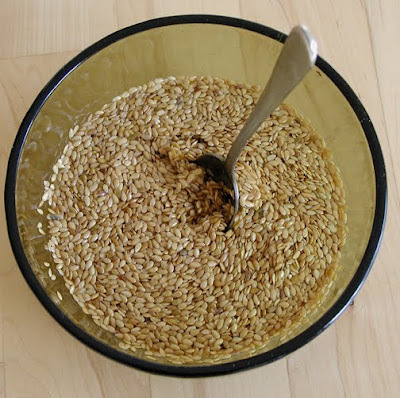 Do not cover the flax seeds with water or add the same amount water, but as little as possible. Here you can see what happens after about ten minutes, you can stand a spoon in the bowl! Now Brigitte just adds kelp to the flax and spreads it out on a dehyrator sheet. I prefer to add some pesto to the crackers, but the variations are endless. 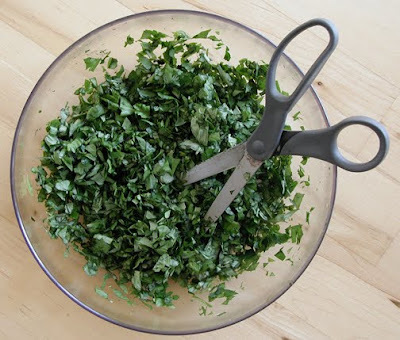 Before I go on to show you how to finish the crackers, here's one of my pesto recipes. I take about half to a cup of walnuts and soak them in enough water to cover for about five hours. Overnight is okay. You can see from this that I've taken the walnuts and mashed them up. You can use a blender, but it's hard to get the nuts to grind without extra water. 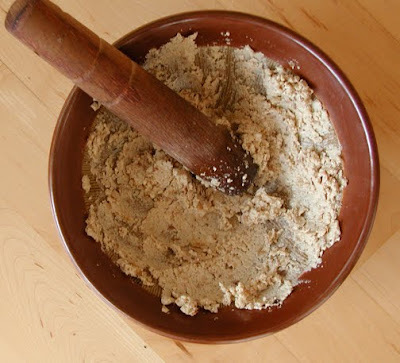 I like a mortar and pestle for grinding nuts. I've tried to use nut grinders or grain grinders like the Bi0mühle variety, but the mortar and pestle works just fine. It takes a while, but it's kind of fun and quieter and, well just peaceful. I love these Asian mortars that are ceramic and have groves cut in the clay to rub the nuts (or leaves) against. They work very well and are surprisingly easy to clean. Cut them! I've found that cutting works better than chopping and I don't have a food processor or blender. Again, it doesn't take that long, is quiet, doesn't use electricity and is easy unless you have arthritis. I've discovered that I can monitor my own arthritis in that if I cut and my hand hurts, I've got to do liver detox (more olive oil and greens, less cooked food.) Pretty soon that big bowl of greens is a quarter the size. Do this first, before you dump the greens into the walnuts. After some mushing, which can take a long time or not, depending on how "smooth" you want your pesto, you have something edible. As I grind the leaves with the walnut mix (pine nuts, pecans, almonds, sunflower seeds, sesame seeds--anything works) I add olive oil. 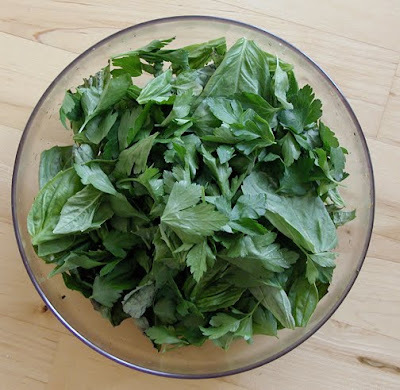 I also add dried nettles or other dried herbs that are good for me but not so fun to eat. If you are adding pesto to crackers, keep the olive oil to a minimum. If you want it for a squash dish like a sauce, add a lot of oil. I can't eat garlic, but, by all means, bring on the garlic if you like it! To get the Parmesan taste, you have to add salt. I don't like yeast, but some people swear by it to mimic the cheese taste. If you have access to raw Parmesan, go for it. 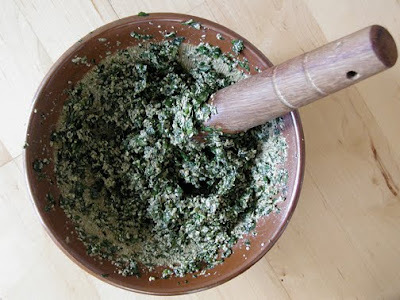 Okay, I added about half my pesto to my flax mix and added in about 1/4 cup of kelp granules. The powder is vile--use the granules. Kelp is also mucilaginous. I also added caraway seeds to this mix. I don't own a dehydrator. Too expensive, and again my hubbie can't stand the noise. Also, even at low temperatures, your house will smell like the seashore when you dry out seaweeds. I got this plastic roll-up tray from the hardware store for $3.00. I found out very fast that drying food in a low-heat dehydrator was a way to get the mice to be friendly. It's also cockroach heaven. Nothing like finding mice turds or cucurachas on your crackers! If you live in a very warm and humid climate, you may want to dry out your crackers in the refrigerator. If you live in a dry climate, let the air do the work for you and don't worry about getting a dehydrator for your (expensive) raw kitchen. I put this sheet of crackers before a fan and they were dry in 24 hours. Spread the mix as thin as you can. When the mix is tacky, but not dry, go ahead and cut the crackers with a knife. A bit tricky, but not as tricky as trying to make crackers out of the gluey, sticky mess they are when wet! Be patient. You want your crackers to be crackers, not crumbly bits of moist seedy stuff. Takes about 24-36 hours depending on the room temperature, whether you use a fan or not, or whether you live in Oregon or Colorado. Stuff in the fridge takes longer to dry. You might get creative and hook up a fan in your fridge! Here are my crackers. I put some avocado on them and made them "artistic" with some peppers and olives. 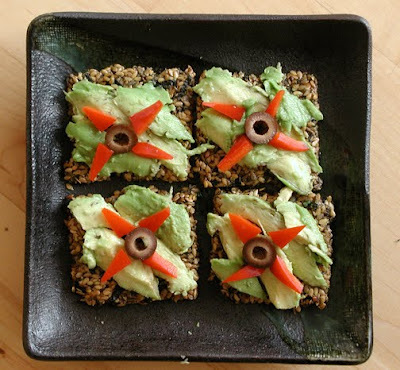 Seed or nut crackers and avocado is a very filling, high-fat, meal that is great for winter.